This earthy soup is perfect to warm you up on a cold day. Add more Sriracha sauce to turn up the heat. In a soup pot, bring broth, miso paste, carrot and shitake mushrooms to simmer. 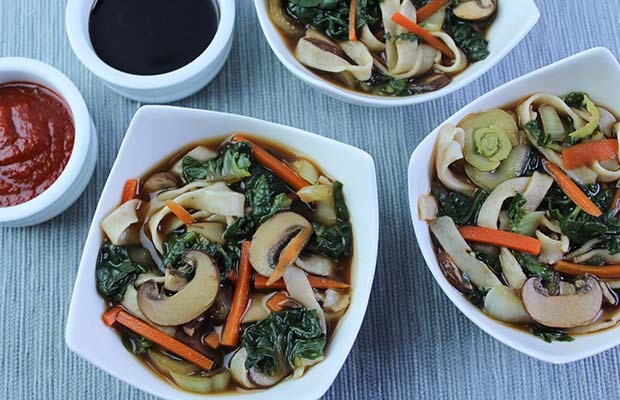 Stir in bok choy and simmer for 3 minutes. Meanwhile, in a large pot of boiling salted water; cook pasta for 3 minutes or until tender but still firm to the bite. Drain well and stir into soup pot with soy sauce and sriracha and cook for 1 minute. Ladle into deep bowls to enjoy. Serving Size: 1 1/2 cup (375 mL). Each serving contains 1 1/2 tsp (7 mL) of flax.